The priest, who had heard more halting recitations of sin than any of the laity would ever believe or could ever understand, said nothing. He heard the tension in the man's breathing, heard the crack of knuckles and the wringing of hands. This was a good sign. The ones who were completely composed either had very little to confess (and who therefore needed little in the way of help from him) or they were not truly penitant (and were therefore not ready to accept the blessings of contrition and absolution). The ones who came in with their emotional armor wrapped tightly around them usually ended up lying their way through the confession. It was disappointing, but the priest consoled himself with the thought that merely being in the confessional was a step in the right direction. He listened to the man's agitation. What he didn't hear was the creaking of the seat or the rattle of the doorknob. There was no indication that the man had changed his mind and was preparing to leave without confessing. So, with the wisdom of age and experience, the priest allowed the moment to stretch for a while before speaking. After a minute or so, the man said, "It's been... it's been a long time since my last confession." "Yes, my son? Months? Or years?" The priest spoke gently, but clearly. This was one of his favorite tactics to get the reluctant to open up. Once they've admitting to something as trivial as having neglected the sacrament of confession, the process of admitting to larger sins became easier. He knew that his voice also reminded them that they weren't alone in this shadowy box, and weren't speaking to a disembodied smartphone app. They were unburdening themselves of their sins, something they could not do by their own power. "Y-years, Father. Many years. A long, long time." The silence fell again, but the man didn't wait so long this time before speaking again. "Father... this is going to sound... bad. I mean, it's going to sound crazy." The man paused. Again, the priest could hear him wringing his hands. "The thing is," the man said, "I think... that is, I know that I... that I..."
"Go on, my son. What is it that weighs on you?" "Father, I killed B.B. King." Silence fell again in the confessional, now punctuated by the man's heavy breathing. Each breath caught in his throat, sounding close to a sob. The priest sat for a moment, his years of experience allowing him to keep his disappointment and irritation utterly hidden. He squelched the urge to sigh and roll his eyes. Even through the screen and in the darkness, he knew that such aspects of demeanor were apparent to a person on the other side. Still, it was disappointing. The man was clearly not a congregant with heavy heart, not a penitant sinner, just a lucid lunatic, giving voice to his madness in the shadows behind a closed door. But no, the priest thought, however absurd the man was, he was clearly in pain and needed some help. Psychiatric help, yes, but spiritual help was a good start, too. "My son," the priest said, "what makes you say this?" "Because I know it's true," the man said. "I killed him. I must have. There's no other explanation for it." "You can rest here, my child. You are safe here in God's presence." The priest knew that telling someone to calm down often had exactly the opposite effect, but that inviting someone to rest usually worked to draw down tensions. "We were all saddened to hear of his death. He was a fine musician, and I understand that he was a good man. It's a great loss, one felt keenly by those who knew him." "You don't understand, Father. I'm not upset because I heard about him dying. Before yesterday, I only barely knew who he was. I'm upset because I killed him." "I know how upset you are. I can hear it in your voice. My son, the confessional is a place of truth, a place where we can take off the masks we show the world. We can reveal ourselves to God in this place. Can you tell me why you think you had anything to do with his death?" "Because I can play guitar. I mean, I can play all his songs, every one of them. 'Sweet Sixteen', 'The Thrill Is Gone', 'Every Day I Have the Blues'... I can play all his hits, note perfect. Not just those, but even the really obscure stuff like 'Sunday Morning' and 'One Shoe Blues'. I can play every riff, every solo, every goofball track he ever laid down." "Father, I couldn't play AT ALL before he died last night! But when I woke up this morning, I had only thought in mind: to get my Gibson back in my hands. MY Gibson? Father, I've never owned a guitar in my life! But I just had to have one. I called in sick to work, Googled the closest music shop and went straight there. As soon as I walked in, I knew something was seriously wrong. There were dozens and dozens of guitars hanging on the wall, the kind of thing that would have been a complete mystery to me. Father, I knew every make and model. It was like I'd spent a lifetime around guitars, like they were my life! I went straight to the Gibsons. 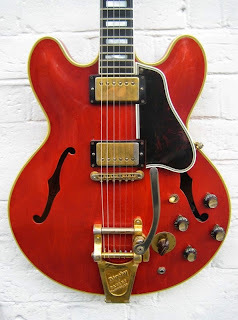 They didn't have an ES-355, so I got an ES-339, the model with a fatter body. They only had brown lacquer in stock, not black or red. 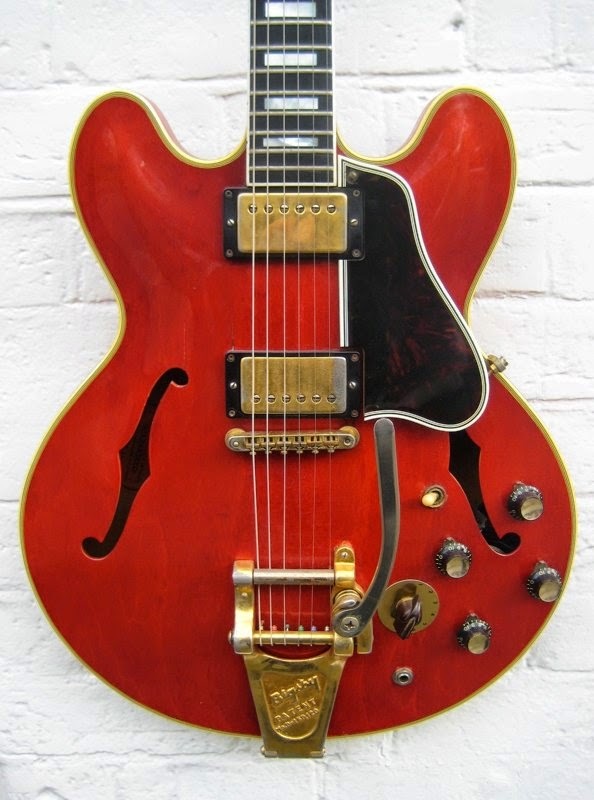 I bought the ES-339, figuring it would be good enough until I could hunt up an ES-355. And Father... that was when I knew." "That I'd killed B.B. King! I dropped $1800 on a guitar this morning, and I don't even play! Or at least I didn't play. As soon as I had it in my hands, I played exactly like B.B. King for ten minutes straight. The saleguy was amazed, but I was terrified. I bought the guitar, a strap, a pitch-pipe, extra strings, and ten picks. I ordered an amp, cables and pickups, to be delivered later this week. I've spent the entire day playing Lu-... playing this guitar, off-amp. But I don't have the calluses of a guitarist. My fingers are sliced to ribbons - I finally had to stop playing because I was spattering blood on the finish, even though the bandages. Father, all of B.B. King's musical ability and knowledge is inside me! I must have killed him and done some kind of a musical vampire thing, drawing out and consuming his soul. B.B. King is dead in the world, but he lives inside me! Help me, Father - forgive me for taking his life! I didn't mean to, I didn't want to, but I did! I killed him!" Sobbing, the man collapsed in his seat, the entire confessional shaking with the force of his anguish. And in the shadows behind the screen, the priest quietly pressed the emergency button, the one that activated the buzzer in the church office. Two shorts and a long... the code for "assistance needed with distraught congregant". This was more than he could handle alone. I think BB King's ghost decided to haunt him for whatever reason. Maybe to show the priest that there are still miracles in the world. Father Anonymous does seem kind of jaded. After you've heard a thousand confessions, I imagine it starts to be just another day at the office. This was a whole other level of weird, but in a good way. BB literally lives in in his music. ..
Bless me, for I am jealous of Tony's story.... Nice work! Thank you! Haven't written a flash in a while. Nice to give it a go. Great story Tony, and so quickly done in the wake of B.B. King's loss. I must admit where I got to the line where he confessed to killing B.B. King that I became rather skeptical of where you were going. You pulled it off magnificently though, and I really enjoyed it. And I will very much miss B.B. King. Whoa, that would be one hell of a thing to go through!